​SELF-AWARENESS IS YOUR SUPER POWER. We so often forget to check-in on ourselves. Through various modalities and techniques, my goal is to help you find balance in your overall well being. Crystals have been around since ancient times for healing, empowering, meditation and protection. Crystals vibrate at their own perfect frequency and we too, have vibrational energy. Sometimes our energy frequencies can get imbalanced for various reasons, but crystals can help you tune back in. During a crystal therapy session, you are required to do nothing more than lie down comfortably on a massage table (fully dressed), close your eyes and relax. Crystal Healing is not a replacement for traditional psychological and medical treatment but simply a tool to help you better understand yourself. Want to know more? Follow the link below. What is Crystal Healing anyway? 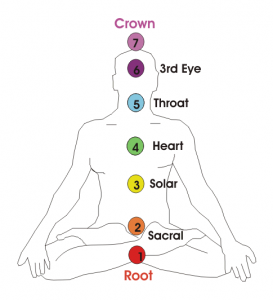 Chakras are the central points of energy that reside in all of us. They are the connecting channel between mind and body, spirit and matter, and past and future. Learning more about your chakras is an empowering journey. Your chakra health says a lot about who you are and how you relate to yourself, others and the world around you. If you are unable to visit for a session but are still interested in learning about crystals and your chakras; consultations can provide a lot of helpful information. I simply ask you be honest with yourself in a thorough questionnaire. I will email you an assessment including techniques and tools to start your healing journey. ​2019 will be bringing some exciting new services including Soul Realignment (Akashic Record Reading) and also lots of fun and helpful freebies are in the works! Keep updated through Facebook and Instagram! ​The Crystal Sparrow is located at Suite 200 on the second floor of Harmony Lane at 111 Banff Ave in beautiful destination, Banff Alberta.